"Everyone Should Have One Warm Coat"
Join us on Saturday, December 8 for a 4 mile and 2 mile run/walk from Mount Carmel Lewis Center. Please bring hats, scarves, blankets and gloves to be donated along with the coats to the charities too! *New in 2018* We are collecting shelf-stable groceries for People In Need of Delaware County. Please consider bringing food items in addition to your coats and other warm clothing for donation. Give back to the communities that open up their streets, trails, paths, and parks to us to be able to achieve our personal fitness goals. Your support allows the running, walking, and multisport community of Central Ohio to maintain a connection to their local community by supporting neighbors-in-need and others in need. It is our way of saying Thank you. Help a homeless family or person stay warm this winter. One of the biggest problems associated with homelessness is teh challenge of staying warm. Your coats, hats, gloves, and scraves will benefit the homeless of Central Ohio. Participants who donate ONE WARM COAT will have their choice during registration to select a Burgundy, Black or Green thermal long sleeve shirt. (Note: No color changes once ordered). The top 3 male and female finishers in the 2 mile receive an award. Award ceremony will be held after the event. All eligible winners must be present to receive their award. No awards will be mailed or delivered. No advance check-in for race. 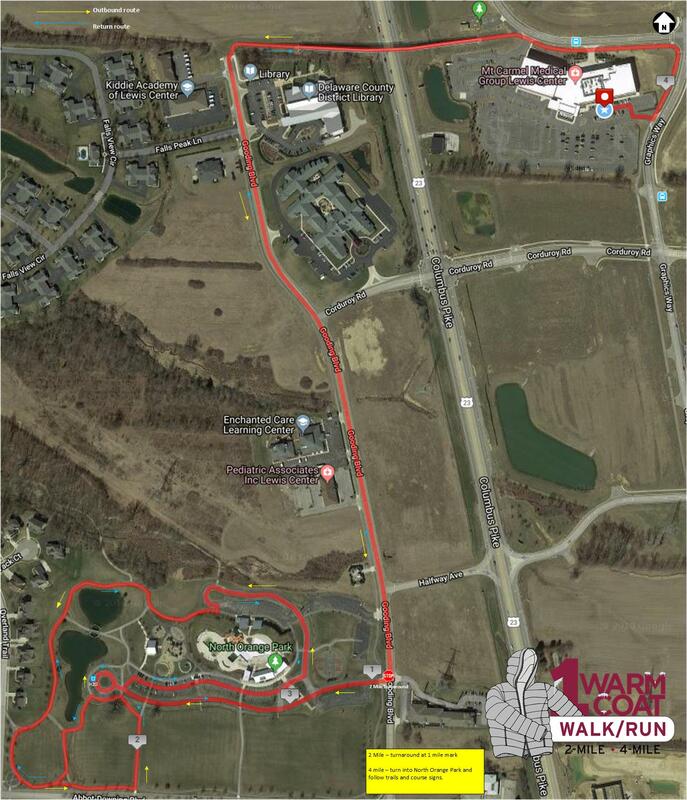 Race Day Check-in and donation drop-off begins at 7:30 am on event day, Saturday, December 8. US 23 North - approximately 6 miles to Mount Carmel Lewis Center (Just North of Mennard's).